Herbs in a cookie? Absolutely! These Rosemary and Lemon Shortbread Cookies are divine! When this months theme for Progressive Eats was announced by my friend Laura I knew that I wanted to redo these cookies. I originally posted this recipe SEVEN years ago and it was long past time for a redo. Not just photos though. Nope, since that first time I’ve modified them a bit and I love them even more. Our menu this month features all dishes that include our favorite herbs and I love that I can contribute a dessert. Who knew? We’ve got a great mix of other dishes too from a cocktail to side dishes; all recipes showing just how versatile these garden favorites can be! Hosting this month is Laura from the blog Mother Would Know. I’ve grown rosemary for years and always in a large pot; as a matter of fact all of my herbs are pot grown. While it can be a perennial in some areas of the country, in Denver our winters get too cold and I’ve always got to start a new plant each spring. I managed to keep one alive inside this past year all through the winter and sat it outside too soon. It got blasted with a late season snow and bit the dust. Grand experiment was both a success and a failure but no matter…I bought more and they’re thriving. I love having parsley, sage, rosemary and thyme right outside my door; as well as chives, cilantro, and mint! When I first made this as plain Rosemary Shortbread, I used a recipe I had found on Saveur. It sounded…I don’t know, not bad, not good, but unique and it did combine two things I love; rosemary and shortbread and I was intrigued. I LOVE rosemary and well, who doesn’t love shortbread so I decided I had to try it. Though I forged ahead I kept thinking; this can’t be right; an herb I normally would use in savory dishes in a cookie with powdered sugar on top? That recipe was simply dusted with powdered sugar and I was almost shocked with just how amazing they were. Still over the years I’ve fiddled a bit and I can’t deny; I love these even more. Feel free to just go the powdered sugar route if you prefer but I just love the extra tang of lemon in the glaze. Actually I love everything about this cookie. Easy, delicious, and elegant enough for a company dessert. I’ve added a couple of things; all relatively subtle but overall really boosted the flavor. 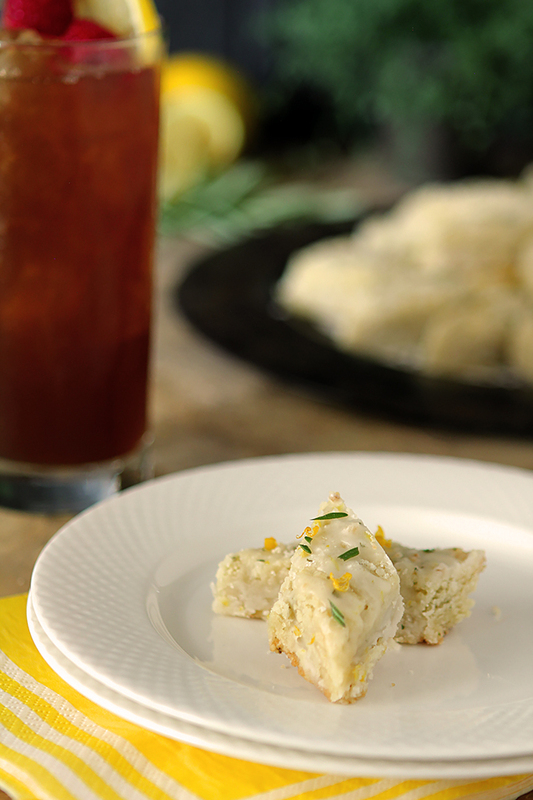 I mean really…who doesn’t love lemon with their rosemary? A bit of lemon in the dough, some vanilla, the lemon glaze and some herbed sugar to top it all off. Seriously help me…I will eat them all by myself if someone doesn’t come over and pry this plate out of my hands! 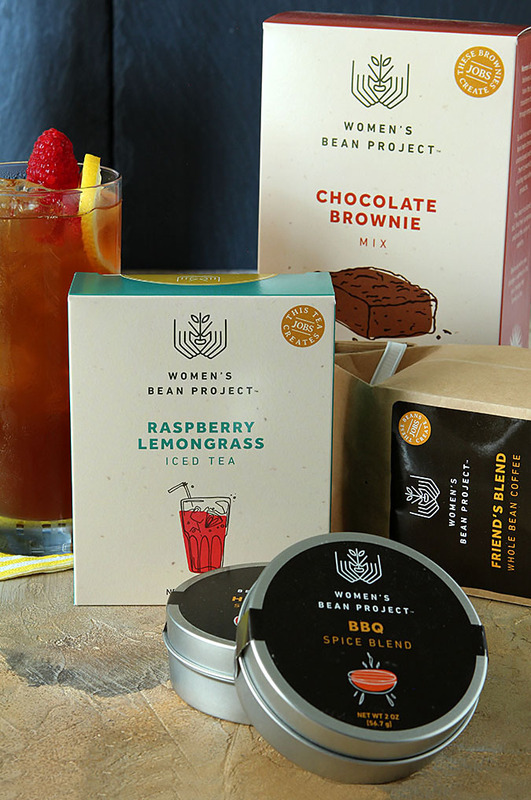 I served the Rosemary and Lemon Shortbread Cookies with a delicious and refreshing Raspberry Lemongrass Iced Tea from The Women’s Bean Project. Have you heard of them? Started in Denver many years ago, their first efforts were putting together packages of ingredients for soup with beans; hence the name. Their mission is to hire women with challenging pasts and teach them to work by creating great products. Being productive and supporting their families helps women find their purpose and end the cycle of poverty. Over the past three years, their average program graduation rate is 77%, their average job placement rate is 98% and the average one-year job retention rate is 93%. These results are gaining national attention as compared to the retention rate of their peer programs which hovers at only 53%. Sales from products generate approximately 70% of their operating revenue and allow them to run a business and pay women a steady income while learning the skills they need to get and keep a job. I’ve been supporting them for many years; it’s a great program and they do rely on purchases to thrive. Please visit their site at http://womensbeanproject.com if you’re interested in supporting a great cause though food. Today they have a wide assortment of available products; I’ve shown some samples above but if nothing else? Get one or more of those bean packets. They’ve got several mixtures and I like to keep a supply on hand; I’ve never been disappointed. Don’t forget to check out my friends contributions to Progressive Eats after the Recipe. 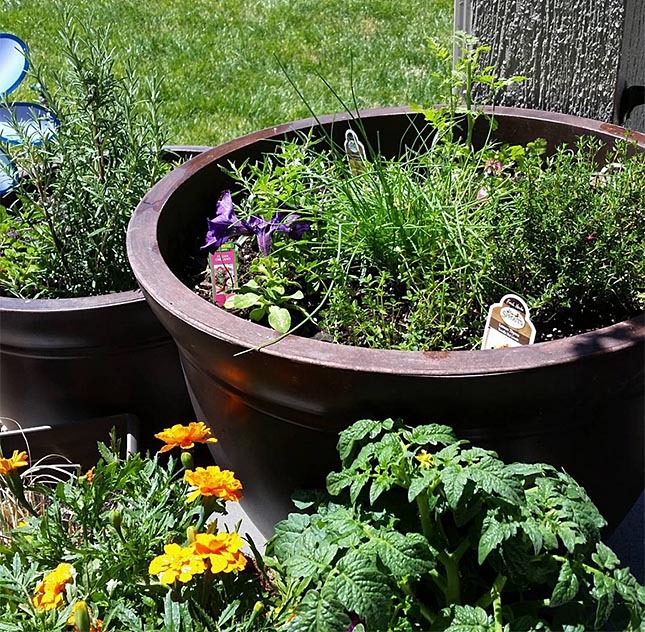 Laura’s title is so perfect…Summer Herbs Every Which Way! Preheat the oven to 350 degrees. Butter a 9-by-13-inch baking pan. Line the pan with parchment paper, leaving a 2-inch overhang on two sides. Lightly butter the paper inside the pan. Add the butter, salt and vanilla to the food processor with the sugar and pulse until combined. Add the flour, about 1 cup at a time, pulsing to combine after each addition. (After the last addition, you may need to stir and scrape down the sides of the bowl to incorporate all of the flour.) Continue to mix until the dough starts to come together. Turn the dough out onto the prepared baking pan and press it evenly into the pan. Poke the dough all over with a fork and bake until the edges are golden brown and the center is golden, about 25 minutes. Remove the pan from the oven and using a bench scraper or knife; cut the shortbread into 1-by-3-inch cookies (I did mine with one cut on the diagonal but that's optional). Cool in the pan for 15 minutes, then carefully remove the cookies using the parchment paper as handles. Using your bench scraper or knife, cut again and separate a bit. Cool completely. For the lemon icing: Combine the confectioners' sugar, lemon zest and juice in a medium bowl. Whisk to combine. Whisk in 1 tablespoon water or more for the desired thickness. Drizzle the icing over the cookies and allow to set. I just use a fork and kind of fling it...nothing fancy! Sprinkle the 2 Tablespoons of rosemary/lemon/sugar mixture over the icing. Since replacing my old food processor and purchasing a smaller one, my new one was not quite large enough to handle all of the dough. I did two batches of approximately half of the sugar mixture, half the butter and 2 cups of flour and then combined both batches together and mixed them well before finishing and patting into the pan. If you have an 8 cup food processor you might not have to do this but just a heads up! If you’re unfamiliar with the concept, a progressive dinner involves going from house to house, enjoying a different course at each location. With Progressive Eats, a theme is chosen each month, members share recipes suitable for a delicious meal or party, and you can hop from blog to blog to check them out. Enjoy! I think your improvements are perfection. Lemon and rosemary are such wonderful friends, and that glaze? Yes please! Another winner Barb! 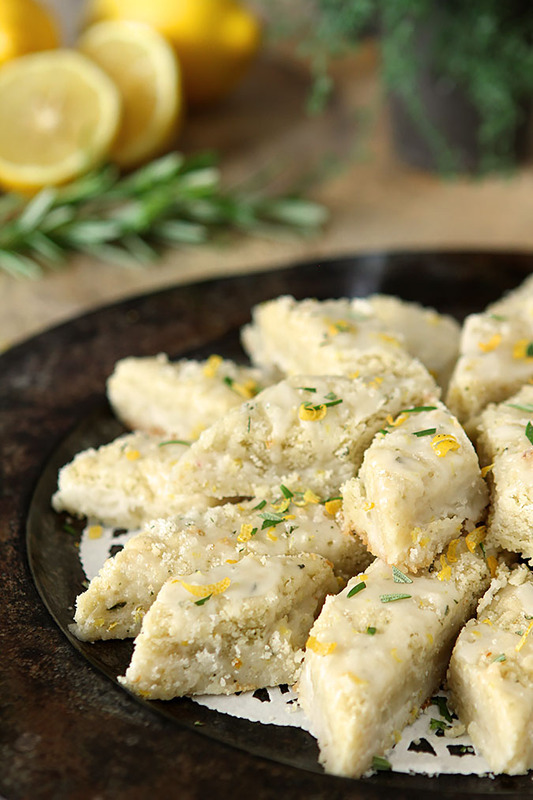 This combo of lemon and rosemary is perfect on its own, but when you combine it with shortbread … I am over the moon with happiness! Gorgeous photos (as always) and the perfect way to end our #ProgressiveEats dinner!! Such an elegant, irresistible cookie!! Perfect with a nice cup of tea. P.S. I’ve been given some bean soup mixes from the Women’s Bean Project. I love what they’re doing! Lemon. Rosemary. Shortbread. You’ve got my number! Love the combo of flavors here — thanks. Oh hell yeah…lavender PLUS rosemary. You’re on to something! Here’s my lavender shortbread cookies recipe, if you’re looking to give another recipe a try. So delicious. Then again, with that much butter and sugar, how could you really go wrong? Anyone else have any favorite holiday cookies? I’m already getting excited for my baking weekends come December, so will have to add some additional sweet goodies to the list! Barbara – I just love that photo with the stacked shortbread wrapped in twine! You’ve inspired me to grow my own lavender…will be making these and thanks for mentioning Brian’s Rosemary shortbread (I heart shortbread). Looking fwd to trying these recipes. Thank you! I think lavender is so easy; it’s a Mediterranean plant so very hardy; low water is important in my garden and it manages with nothing but rain from above. Be sure to check out the lavender lemonade martini I did recently; it is soooo good! Thanks Greg. It’s good to know I CAN be found! You have piqued my interest; what were you wanting to use lavender for? Beautiful photos indeed! I recently tried lavender shortbread and rosemary too but not together. Bookmarked for later. Oh…they weren’t together; I made a different batch using each in one of them. Just tied them together in this one post cause, well, they’re herbalicious! I’m loving these. You are inspiring me to want to work with lavender. Thank you…just love using herbs in something traditionally considered just a ‘sweet’ – now wondering what else else to try. Sage? Mmm, probably not! Thanks Paula, coming from you that will help heal the wound of FG #FAIL! I need to do more with lavender now that I’ve started; am curious about other ways to use it. There is also a company on line that does a lavender rosemary salt; sounds cool, huh? Barb, that is a beautiful photo!!! I’ve got one lavender plant and have used it once in Ice cream. It was a little overwhelming but good. Also had lavender vinaigrette at Restaurant Kevin Taylor years ago… DEElicious. I’m afraid my blooms have already come and gone and I’ve missed an opportunity to find it in my kitchen. Darnit, these shortbreads look scrumptious. Thank you Lea Ann! You should try the rosemary too; more unexpected than the lavender in a sweet and maybe why I was so impressed with how good it is. I keep seeing herbs showing up in sweets, lately, and was skeptical. But this sounds like a must-try. Time to take the leap, myself! I like them both…but surprisingly think I love the rosemary the best! I would vote for the lavender lemonade (with or without the vodka) and the rosemary shortbread.